This year, there has been a much larger focus on virtual reality, augmented reality, 360 degree videos, and anything else that can provide a more immersive experience to the viewer. Admittedly, it’s all still at a very nascent stage, but there are already some very exciting things going on in this regard. Samsung is one of the first companies to deliver a standalone product that provides 360 degree video, along with a few other interesting features. What is device capable of? We find out, in this comprehensive Samsung Gear 360 review! The first thing you will notice with the Gear 360 is its futuristic look, with it featuring a spherical shape with a couple of camera units and buttons to be found on an otherwise smooth and sturdy body. On either end are large fish eye lenses that work in tandem to create the 360 degree video. There are a couple of buttons to found on one side, that gives you a little bit of control over certain settings and features, and up top is a large recording button, below which is a small screen that shows information like the duration of the recording. There is a cover on another side that, when opened, reveals the microUSB charging port, a microSD card slot, that allows for storage up to 200 GB, and a 1,350 mAh battery that is removable. Apart from aesthetics, what this cover helps with is to make the device dust and splash resistant, which is always useful, and somewhat necessary, with a product that will be regularly used outdoors. As far as the battery life is concerned, there have been no issues with the device running out of juice during a recording session. However, if you do have any long form recording planned, especially if both lenses are being used simultaneously, carrying around a battery pack or a spare battery will be a good idea. The Samsung Gear 360 features dual 15 MP sensors with f/2.0 apertures, and both are fish eye lenses, which means that each camera is capable of capturing a 180 degree photo or video. Of course, if you are using both of them at the same time, you will be able to put together full 360 degree content. There are small lights next to the lenses that indicate which cameras are being used. As mentioned, one of the impressive aspects of the Gear 360 is how solid its build feels. The build quality is certainly premium, and the buttons offer good tactile feedback, with a good amount of click to them. You also get audio prompts that are really helpful in letting you know that you are getting around the menu and settings, that can be seen in the small screen up top. There is also a small tripod stand that comes with the device, which can be closed and used as a holder as well. Of course, this tripod can be removed, revealing a tripod mount that can be used to attach the Gear 360 to any standard tripod. As far as mobility is concerned though, the tiny tripod that the device comes with is certainly very useful. The main hindrance when it comes to the software experience of the Gear 360 is that it requires being paired with one of the newer high-end Samsung smartphones, such as the Galaxy S7 and Galaxy S7 Edge, or the Galaxy Note 5. While the app is available for download from the Google Play Store, it seems to be incompatible with the majority of Android smartphones out there, and your best bet is to have a Samsung Galaxy device at hand. The camera app itself provides a very familiar experience if you’ve ever used a Samsung smartphone before. You get a lot of control here, such as the ability to turn HDR on or off, change the exposure via the manual mode, adjust the video size, and toggle between various modes. Other modes, apart from photo and video, include time lapse, and a looping video mode, that will take a certain amount of user defined video, and discard that, unless you stop it from doing so. This is nice way to save on storage, and allows you to easily decide what you want to keep or get rid of, without needing to later edit a long video. Of course, if you don’t have a high-end Samsung smartphone handy, a really good thing about the Gear 360 is that it can be used as a standalone product for the most part. Granted, you won’t get the granular control that is available via the camera app, but the buttons on the left, and the record button up top, can be used to toggle through the few settings that are available. The main setting that was used most of the time was the ability to switch between using both cameras or at the same, or just one of them. The Gear 360 offers recording and photo capture capabilities in different resolutions, including 2K and 4K. You get two 180 degree video cameras with this device, one on either side of it, and you aren’t just limited to using both together for 360 degree video. You always have the option of using just one of them, making the Gear 360 a very viable tool for something like vlogging, or capturing 180 degree photos or video, that lets you get a lot more of the landscape or background into a shot. The two sensors with fish eye lenses are of a very high quality, and output very nice looking photos and video, particularly in well-lit situations, which is generally where an action cam would be used. I actually ended up using one of the cameras most of the time instead of both. That’s not to say that 360 degree video is something I’m not into, but this was because of what a wonderful job this device did when used as a standalone vlogging rig. When using the cameras individually, you can get some high quality video with either, without much fuss at all. Assuming you will use the Gear 360 primarily for 360 degree photos and videos, if you have a Samsung smartphone, transferring the photos and videos from the device to the phone is very easy. All you have to do is select it, and it will copy the content to the phone and stitch it together using the software in the phone. If you are using a PC though, the Gear 360 comes with a license key for the Gear 360 Action Director, powered by CyberLink. You can put the photos and videos into the Action Director project, and it will begin to perform the stitching process for you. Right off the bat, you might notice that there is a problem with the stitching process. Especially when you have two different exposures on both of these lenses, it will be very evident in these videos. While the Gear 360 is capable of capturing some very high quality video, it may not seem as though that is the case, when you take a look at the 360 degree video below. The reason why is because a 4K video is being put into a viewer that zooms far into the frame to create illusion of a 360 degree or VR experience. Zooming into a even a 4K frame will make the quality appear to be much lower that it usually is, and that is something that a lot of people may not know about 360 degree video. For now, this is the kind of look you can expect from devices like the Gear 360 or the LG 360 CAM, and it certainly won’t match up to the super high quality video that will be possible when using something like numerous GoPro cameras at the same time. So, there you have it for this in-depth look at the Samsung Gear 360! Overall, the Gear 360 may be one of the best ways of getting into 360 degree video right now. Priced at $349.99, it is more expensive than the LG 360 CAM, but is also less than pretty much any other rig out there that features more than one actual camera. As as standalone product, it does a wonderful job of providing that entry point into 360 degree video. However, what I appreciated most about the Gear 360 the fact that you can also use only one side as an action camera, and if you do use it as such, you get a wonderful vlogging rig that is compact and portable. All said and done tough, what is great about this product is its dual camera setup that allows for good quality 360 degree photos and videos, and lets you have some fun with what might be the future of our video content. What do you think of the Gear 360 and do you plan to buy one? 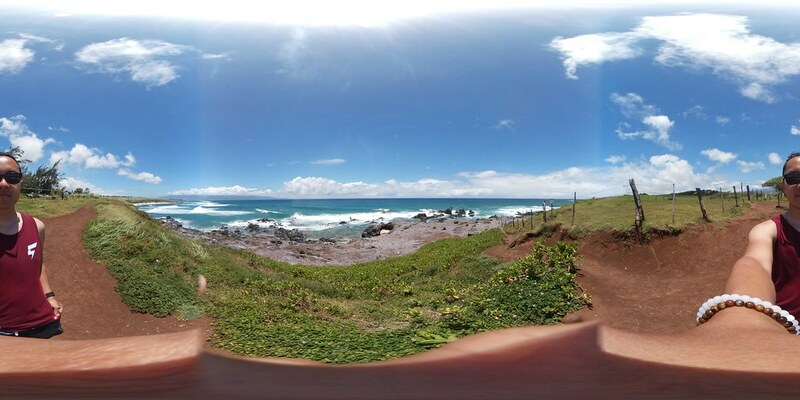 Would you like to take 360-degree photos and videos everywhere you go or is this just a fad that will pass? Do you own a VR headset and if so, which one? Let us know your answers and thoughts in the comments below!